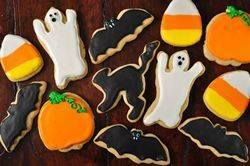 Halloween Cookies take sweet and buttery flavored sugar cookies and covers them with royal icing. The trick to making the perfect frosted Halloween Cookie is to bake the sugar cookies until their edges are tinged with brown, as this makes them sturdy enough to hold up to being covered with the icing. Once the Royal Icing is spread on the cookies, it will take several hours, or even overnight, to dry completely and become wonderfully smooth and hard with a matte finish. Keep in mind that humidity affects the amount of time it will take for the icing to dry, so if possible, do not frost these Halloween Cookies on a humid day. Royal Icing is a pure white icing that dries to a smooth, hard, matte finish. It can be made two ways; with powdered sugar, egg whites and lemon juice or with powdered sugar, meringue powder, and water. I have given a recipe for both. While I think the royal icing made with egg whites tastes better, those that are concerned about the risk of salmonella, will want to use the royal icing that is made with meringue powder. Meringue powder is a fine, white powder that contains dried egg whites, sugar, salt, vanillin and gum. It can be found at most cake decorating and party stores or else on-line. Now, let's talk about which type of food coloring to use. I like to use the concentrated gel paste dyes that are sold in small 1/2 or one ounce (14 - 28 grams) containers. Only a very small amount is needed to color the icing, and I measure it out using the end of a toothpick. Make sure to thoroughly mix the paste into the icing as you do not want streaks. You can buy gel pastes at cake decorating stores or stores like Michael's or Joann Fabric and Craft Store. Note: Candy eyes can be found at cake decorating stores or you can order them online at http://www.candylandcrafts.com/. The "eyes" can also be made by piping small black dots using a tube of black icing, or you can also use miniature chocolate chips. Halloween Cookies: In a separate bowl whisk together the flour, salt, and baking soda. Set aside. In the bowl of your electric mixer (or with a hand mixer), beat the butter and sugar until light and fluffy (about 3 to 4 minutes). Add the beaten egg and vanilla extract and beat until combined. Add the flour mixture and beat until you have a smooth dough. Wrap the dough in plastic wrap and refrigerate for about one hour (or overnight) or until firm enough to roll. Remove the chilled dough from the refrigerator and, on a lightly floured surface, roll out the dough to a thickness of about 1/4 inch (1 cm). (Keep turning the dough as you roll, making sure the dough does not stick to the counter.) Cut out shapes using a lightly floured cookie cutter and transfer cookies to the prepared baking sheet. If you find the cookies a little soft, place the baking sheets with the unbaked cookies in the refrigerator for about 10 minutes to chill the dough which prevents the cookies from spreading and losing their shape while baking. Note: The recipe can be doubled. Makes about 20 - 3 inch cookies. Royal Icing with Egg Whites: In the bowl of your electric mixer (or with a hand mixer), beat the egg white with the lemon juice. Add the sifted powdered sugar and beat on low speed until combined and smooth. Add coloring. The icing needs to be used immediately or transferred to an airtight container as royal icing hardens when exposed to air. Cover with plastic wrap when not in use. Royal Icing with Meringue Powder: In the bowl of your electric mixer (or with a hand mixer), beat the confectioners' sugar and meringue powder until combined. Add the water and beat on medium to high speed until very glossy and stiff peaks form (4 to 7 minutes). If necessary, to get the right consistency, add more powdered sugar or water. Add coloring. To cover or 'flood' the entire surface of the cookie with icing, the proper consistency is when you lift the beater, the ribbon of icing that falls back into the bowl remains on the surface of the icing for a few seconds before disappearing. The icing needs to be used immediately or transferred to an airtight container as royal icing hardens when exposed to air. Cover with plastic wrap when not in use. Mead, Matthew. Matthew Mead's Monster Book of Halloween. Time Inc. New York: 2009. Ojakangas, Beatrice. The Great Holiday Baking Book. University of Minnesota Press. Minneapolis: 1994. Pappas, Lou Seibert. 'the Christmas Cookie Book'. Chronicle Books. New York: 2000.